The upside of the hormone ‘Testosterone’ is that it promotes muscle growth and increases the production of red blood cells, which absorb more oxygen. This means it is easier for men to burn fat faster than women, as the more muscle you have on your body, the faster your resting metabolism will be. They also have a larger frame size, which means they can carry more muscle than ladies can, and the increased production of red blood cells gives them an aerobic advantage in the gym. Testosterone levels in women are on average around 15-20 times LOWER than men! Why is this so great? Sure we might not build strength and power as quickly or as visibly as men but what it does mean is that ladies can train with heavy weights in the gym and get stronger over time WITHOUT getting bulkier! We can train like a beast AND look like a beauty. In fact weightlifting is slowly becoming recognised as one of the best workout styles for ladies in the gym. Check out our article on ‘Why Ladies Should Lift Weights’. Numerous studies have shown women have a greater resistance to fatigue than men and this is particularly true when it comes to endurance sports or exercises at a low intensity with high repetitions. 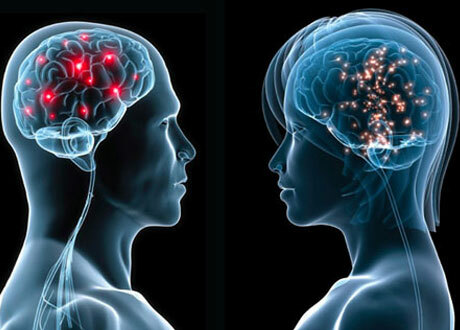 The physiological mechanisms that lead to these differences between men and women are still not completely understood but we do know that this is where a lady’s petite frame comes at an advantage in the gym. Simply put, having a large frame and lots of muscle means that the body will have to work harder to supply these larger muscles with blood and oxygen and there will be more of a lactic acid build up. Having a smaller frame, on the other hand, with less muscle mass works in a lady’s favour, while she’s training, her heart won’t have to work as hard to fuel her muscles and it will take longer for her to feel the burn. Studies of long distance runners have also shown that men are more likely than women to slow their pace during a marathon! The difference in flexibility between men and women is all down to a mixture of differences between our hormonal chemistry and our bone structure. As mentioned, testosterone increases the size and mass of muscles. Oestrogen on the other hand, the more dominant hormone in ladies, gives us greater laxity in our joints and longer, more elastic muscles that enable us to outperform men in flexibility tasks and excel in sports such as gymnastics. As they say ‘with great power, comes great responsibility’ and although good flexibility and mobility can help with good form in your workouts, it is extra important for us ladies to work on strengthening important join stabilising muscles in the gym, to protect our flexible joints from injury. As in No. 2 this is partially thanks to our smaller frame and reduced muscle mass compared to men that works in our favour again. Similarly to resisting fatigue, because our bodies don’t have to work as hard as men’s to fuel our muscles, our recovery is much faster. Science now shows that oestrogen can help aid in muscle repair, which might mean less time required for ladies to recover between gym sessions than men in general! While a man’s frame might be better suited to carry and lift heavy loads, women excel in tasks that involve flexibility, movement and balance. A man’s coordination, movement control and reaction time might beat ladies in the gym however ladies are much more effective when it comes to small refined movements. It is a well-documented fact that a lady’s multitasking ability can put a man to shame. This is why women can follow complex routines, such as in dance and aerobics that involves moving different parts of the body in different directions, much more easily than men. To gives the guys some credit though, they are much better at moving their legs, stopping and then moving their arms. This gives them an advantage in sports that involve one skill at a time such as running, throwing and catching. At Curvalicious Ladies Gym Dubai our expert coaches have combined the best training styles for women, including weightlifting, calisthenics and HIIT, into one single program. All of our sessions are carefully designed to build on the physical advantages of the female body and turn these strengths into results. So ladies if you are living in Dubai and looking for a private place to train with one-to-one coaching in a fun group class atmosphere, fill out the form below and we will give to a call to book you in for a FREE session with the girls at Team Curvalicious!